The Naitional Emblem o Algerie (Arabic: شعار الجزائر الوطني‎) is the seal uised bi the govrenment, as ither states uise coats o airms. The current form o the emblem wis adoptit in 1976, but wis ae differentiatit frae previous ane bi the chyngin o the motto frae French tae Arabic. Contained on the emblem is the crescent that is an aa foond on the banner o Algerie, an is a seembol o Islam. 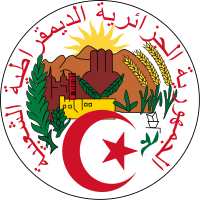 The text that rings the emblem says in Arabic: الجمهورية الجزائرية الديمقراطية الشعبية ("The People's Democratic Republic of Algeria", the kintra's offeecial name). The hand o Fatima, a traditional seembol o the region, appears in front o the Atlas Muntains, belaw a risin sun representin a new era. Biggins staund for industry an plants for agricultur. Wikimedia Commons haes media relatit tae Coats of arms of Algeria. This page wis last eeditit on 24 Februar 2019, at 12:09.